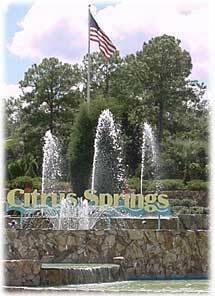 Homes For Sale In Citrus Springs Florida Real Estate and Land For Sale In Citrus Springs. - CENTURY 21 J.W. Morton Real Estate, Inc. Located in the northern part of Citrus County, Citrus Springs is a large community that offers residents peace, security, and lots of space, all while preserving the surrounding natural environment. Citrus Springs is a wooded community, designed to incorporate natural vegetation and landscaping, as well as maintaining a great sense of space between houses. Residents will find that the layout of the neighborhoods and home sites provide a wonderful sense of privacy and security that rivals any large community. Homes are beautifully kept and neighborhoods remain well-manicured and are equipped with a public playground and sports field. Citrus County is home to some of the best golf courses in the state, and some of these are located within just minutes of Citrus Springs. The Citrus Springs Golf & Country Club is a challenging course with plenty of sloping hills and tricky greens. El Diablo Golf & Country Club, named one of the best public golf courses in the nation, is famous for its ball-swallowing rough, slick greens, and lush, narrow fairways. Rainbow Springs Golf & Country Club offers an 18-hole championship course that will challenge every golfer, and just across the street, a short nine-hole course provides excellent opportunity to hone those fairway shots. For other means of entertainment, residents can explore the rest of Citrus County, including Beverly Hills, Crystal River, Homosassa, and Inverness. These towns have plenty of shopping options (retail stores, home improvement stores, electronics shops, and more), as well as a wide variety of restaurants to choose from. From franchise to mom-and-pop places, good old home-cooking to Chinese buffets, no one will be left hungry! Ocala Florida, located in neighboring Marion County, is also just a short distance from Citrus Springs. This larger city has much to offer in the way of entertainment and excellent cuisine. If you are looking for a refuge from the hectic pace of city life, contact us today to learn more about the homes for sale in Citrus Springs Florida.